Paintless Dent Removal means ability to fix dents without painting =Saved$$$'s =Smile! Dents with uncracked paint are mostly repairable at half the cost of panel beating shops. "Superlative PDR" is competent with all PDR repair technique's, and delivers the finest quality workmanship, attention to detail is to the extreme. "Superlative PDR" has the tools to get the job done. If you require perfection, contact "Superlative PDR" to repair your vehicle. Mazda2, sharp creased dent on right front door, repaired by "Superlative PDR"
Nissan Almera left 1/4 panel buckled outward ridge distortion. Nissan Almera left 1/4 panel buckled outward ridge distortion, repaired by "Superlative PDR"
SAAB Convertible right quarter panel, repaired by "Superlative PDR"
SSV Holden Ute, Right 1/4 panel repaired by "Superlative PDR"
Rav4 left quarter panel dent, repaired by "Superlative PDR"
Hyundai I-20, left front guard dent, repaired by "Superlative PDR"
GT350 Skyline left front guard dents, repaired by "Superlative PDR"
Get a fast quote: A photo of your dent is the easiest way to describe it, so SMS a photo of your dent for a fast quote to 0419 190 752. Email a photo of your dent to [email protected] . All Insurance claims to small private repairs. 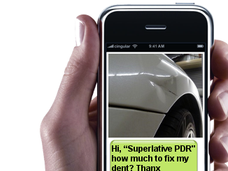 Licenced Repairer: Paintless Dent Removal @ "Superlative PDR"